I’m telling the truth when I say I’m leaving Italy with some “pasta babies” located on the thighs, hips, love handles and even one clinging around my mid-section. I’m relying on the heat and walking in Morocco to abort all the “pasta babies”. I first started growing my pasta babies during our month visit in Lanciano which meant eating at a buffet for 99% of the meals, and I think we all know what buffet eating leads too. My pasta baby situation only got worse when Chris and I headed to northern Italy to visit my dear friend Christine who is currently studying abroad. Her university program has her living in three different countries this year: France, Italy and Spain. We were lucky enough to catch her in Piacenza, Italy. Christine....and we are the apples in her eyes. I met Christine 10 years ago, in Lanciano Italy, on my first day of Grade 10. We were sitting next to each other at the back of the bus. I had just turned around from waving goodbye to my parents and brother Geoff and was trying to hold back tears from the fright of being alone in boarding school, when Christine tapped me on the shoulder and asked if I had a pen and paper. With that, our lifelong friendship began. 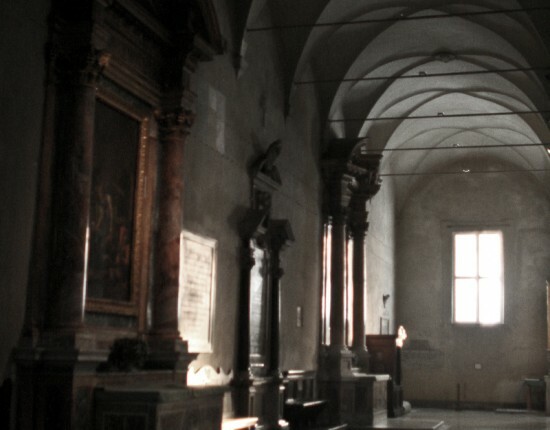 Piacenza is a 45-minute train ride from Milano. 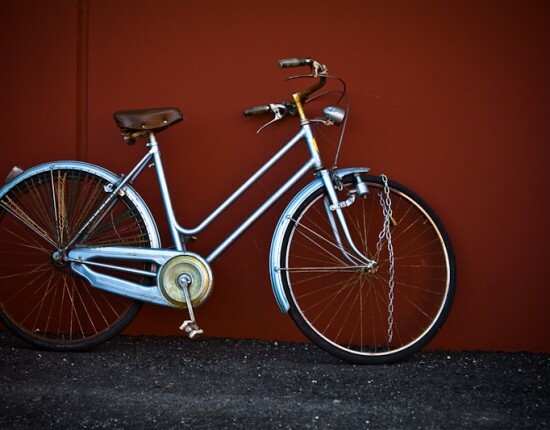 95% of the population own and ride cruiser bicycles, nearly all of them are equipped with baskets and/or saddle bags. 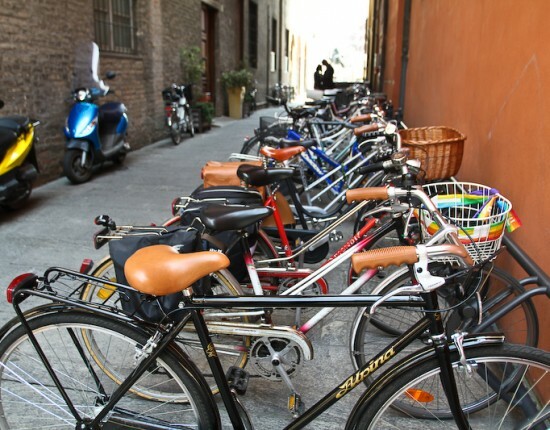 It is not an uncommon site to see people, of all ages, biking home with their basket full of the parmaggiano and fresh vegetables from the market. 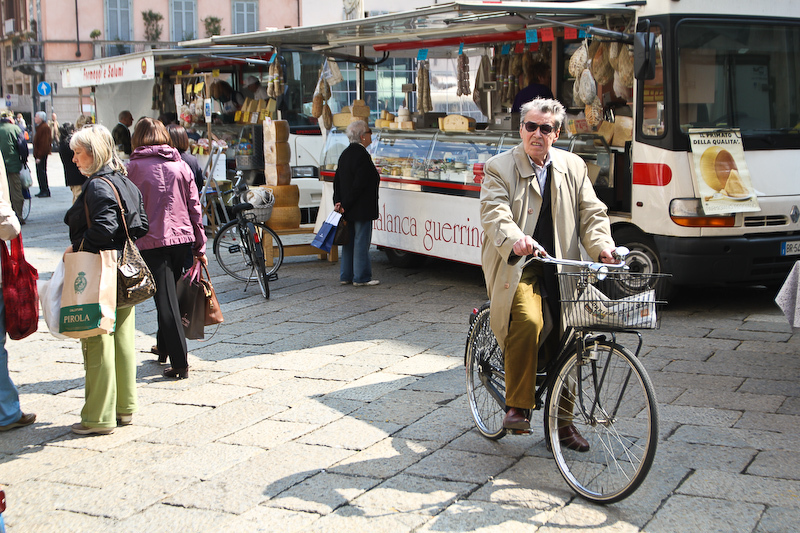 Bikes and markets are the two main ingredients of Piacenza. 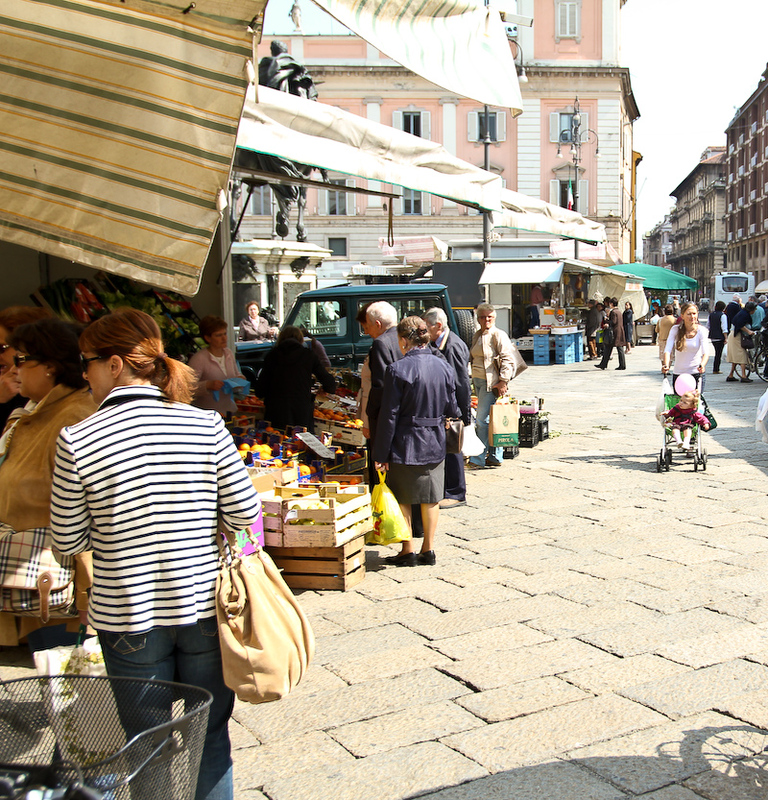 Piacenza has many markets that set-up in the main piazza throughout the week. 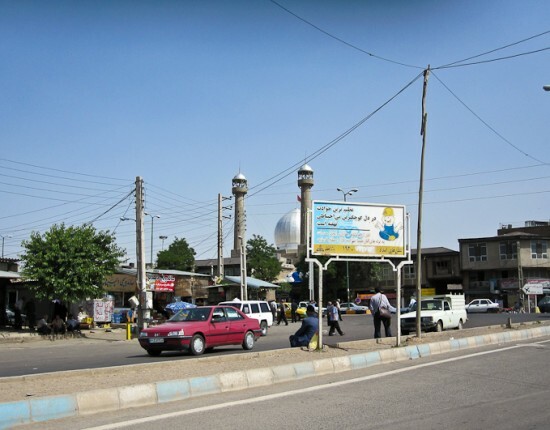 The town centre has a youthful, vibrant energy even though the buildings and streets are thousands of years old. The main piazza is a wonderful piece of architecture. The facade of the main building has numerous arches. If you look closely at the detail, each design is entirely unique. The main basilica is modest compared to most with a facade made of brick, but inside its high vaulted ceilings with dark oil paintings hold a beauty that we new world people can never get enough of. 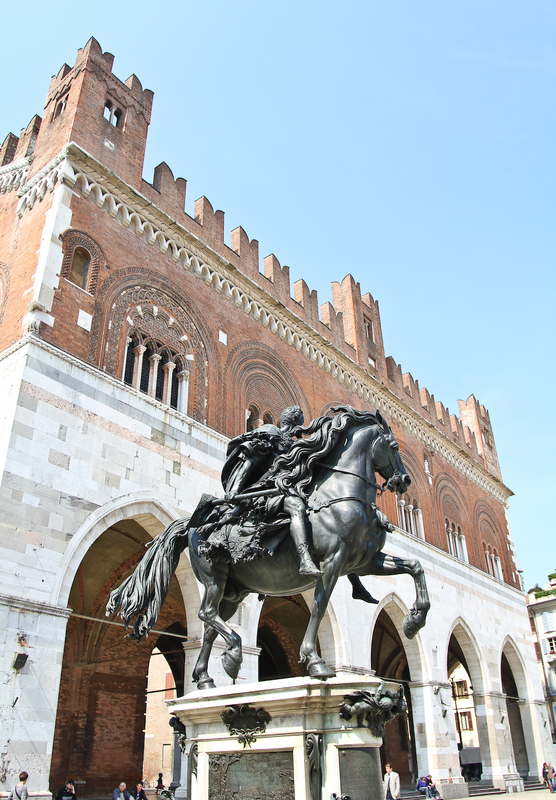 The main building in the central piazza of Piacenza, Italy. 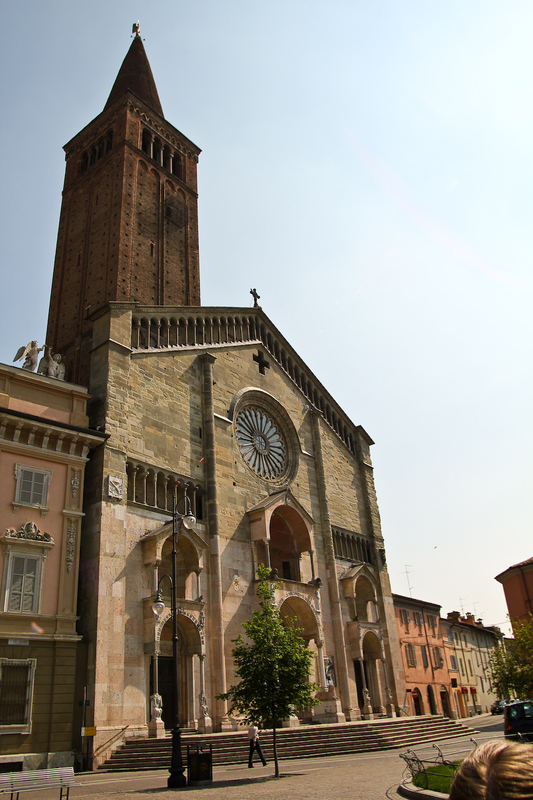 One of the basilicas found in Piacenza, Italy. Almost every fourth building is a church. 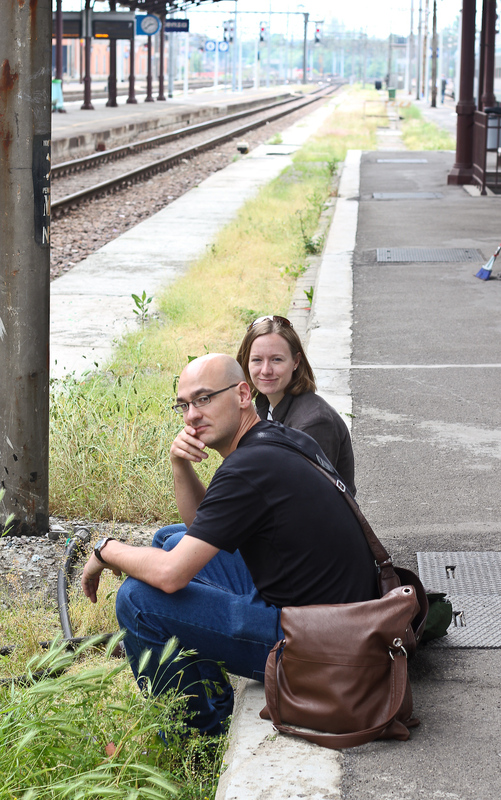 Chris and Christine waiting for the train. 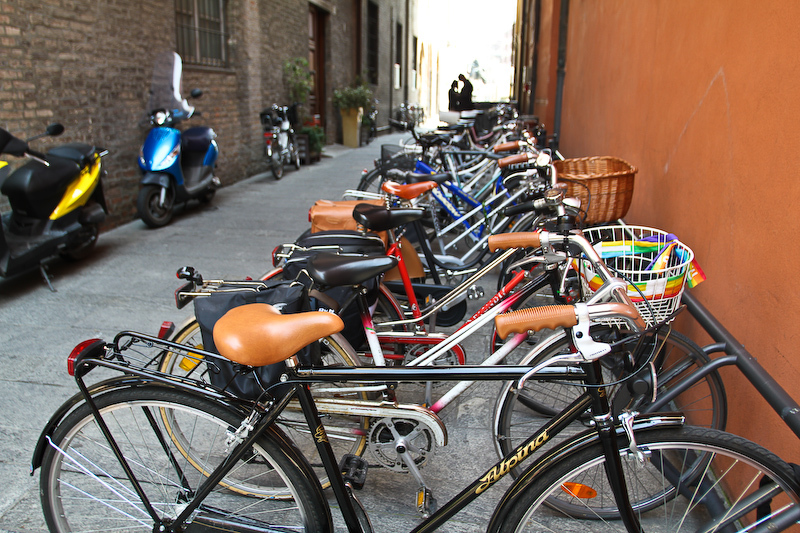 We enjoyed a day trip to Parma, Italy. Every day in Piacenza, we woke-up around 11:00, made multiple espresso’s and a luxurious breakfast consisting of Italian eggs (which by the way have the most incredibly rich tasting yokes I’ve ever tasted in my life. Apparently some chefs will refuse to make a recipe if it calls for Italian eggs and they can’t get any!) Anyways for breakfast we also enjoyed yogurt, tomatoes, apples, oranges and bread. 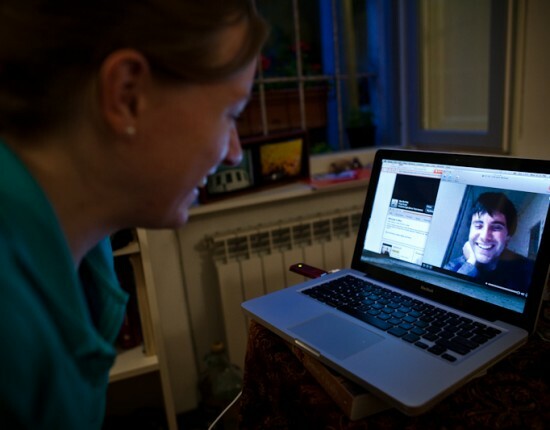 We talked for hours. Went on casual walks and almost daily we did grocery runs, for food was our main objective. Christine loves cooking and we love eating. Every lunch and dinner Christine, with a little bit of support from us and Jamie (the guy who wrote the fantastic cook book she used for at least 10 of the meals we ate) would create meals that made our toes dance with happiness and our bellies swell with the pride of a king. Without any exaggeration, every lunch and dinner contained garlic, basil, olive oil, wine, salt, pepper and tomatoes. 95% of the time the base of the meal was pasta: penne, tortellini and linguini. The pure rich flavour of the pasta alone would be hard to match with brands bought in Safeway. The other 5% of the time we ate the most mouth watering home-made pizza. 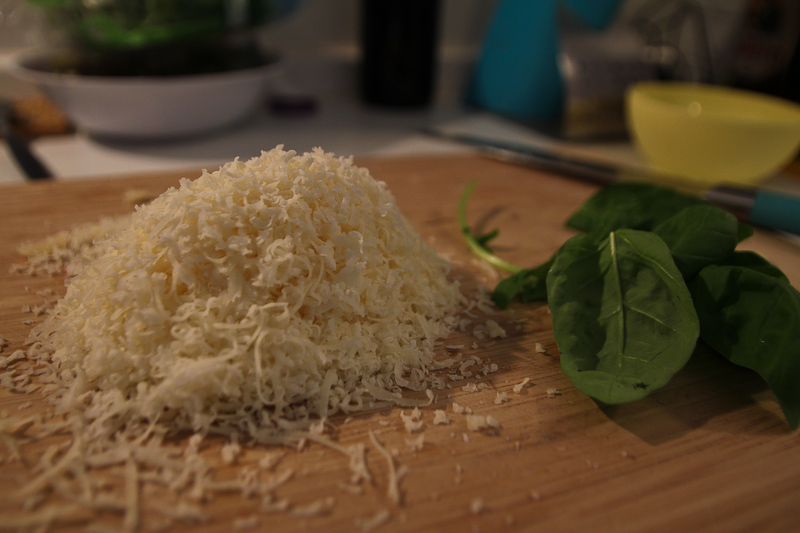 We ate mounds of freshly grated parmaggiano everyday. Home-made Italian pizza, made in Italy with Italian ingredients by Christine. Everything was from scratch, even the dough. Christine’s sore shoulders from the relentless kneading can attest to this. This flavourful dough was made with flour #zero which is specially produced for pizza and may be hard to find in regular grocery stores in Canada, so head to your nearest “Little Italia”. Each pizza had simple and few toppings. I believe this helped us appreciate the texture and taste of each bite. I hope these photos give your belly the slightest ping of hunger, for none of them do Christine’s fantastic, tasty cooking the justice it deserves. 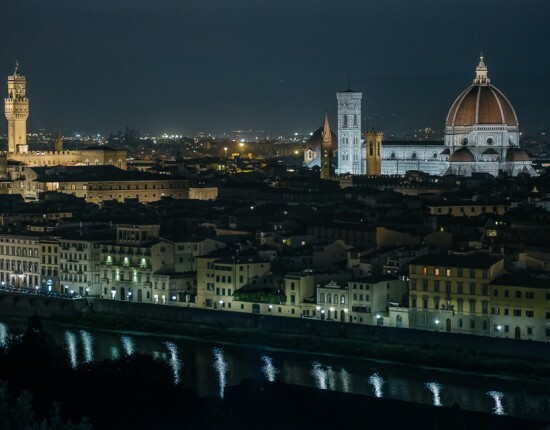 The food in Italy sounds incredibly–well worth the pasta babies? I’d love to feature one of your posts on Pink Pangea (www.PinkPangea.com), a travel site specifically geared towards women travelers. 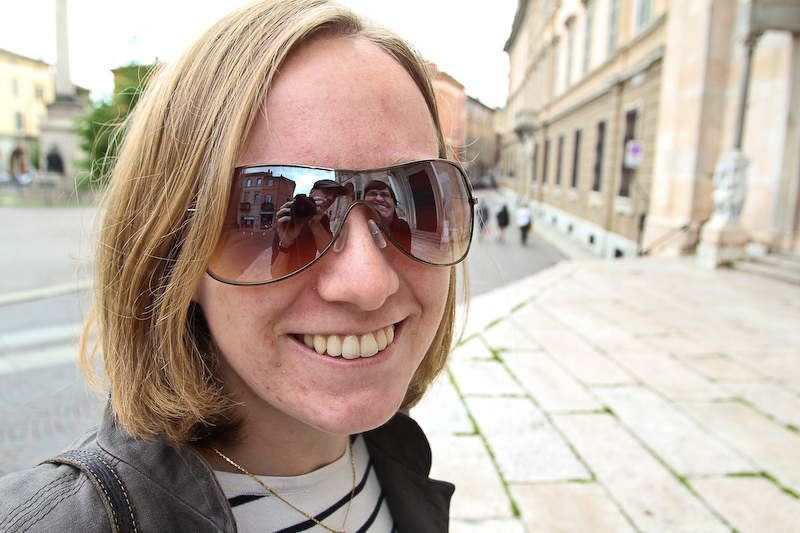 Submit a photo of yourself in Italy or elsewhere and write a post about your experiences. You might also want to provide some tips for other women travelers to the country you write about. We will be sure to link back to your site. Omg I’m sooo hungry now! do those pictures come with recipes? hunh? hunh? O and I got your note Laura… thank you! Hope you are having a faboooo time! 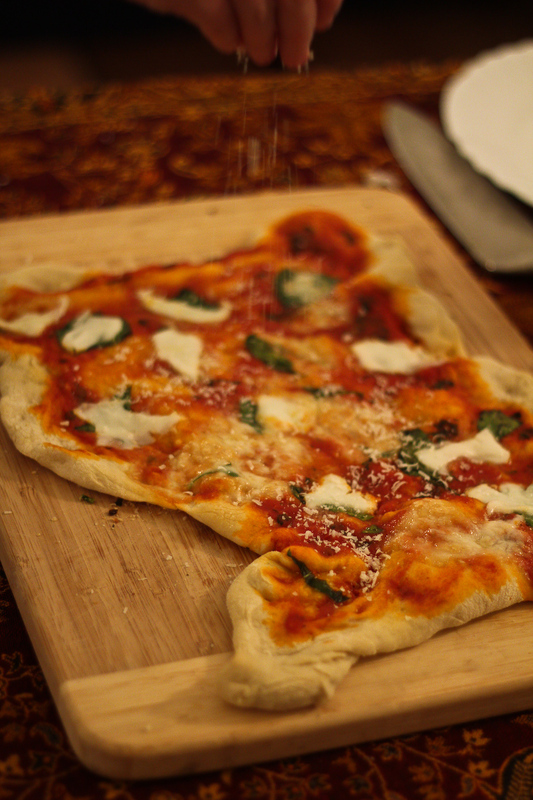 is the home made italian pizza made in Italy from italian ingredients also in the shape of Italy? kind of looks like it. as well as looks delicious!!! still very jealous of you all but you did get me to sign up for couch surfers so that when i start traveling i can try that out as well as maybe host some people here in Dallas! !